So, the tree is up, but I am too pooped to do the rest, so I will leave you all with these tidbits... no pictures of the whole tree until all of the little villages are up, and the house is all Christmassy! 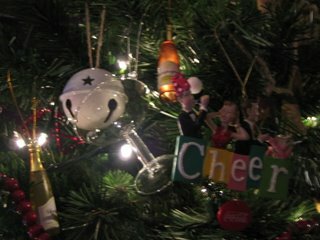 Nothing like a little Christmas cheer... martini, champagne and a party! My favorite drink in the world... 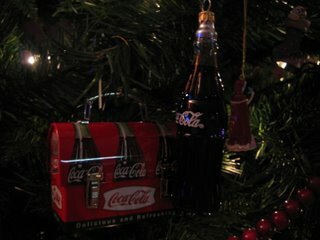 I have 7 of the little Coke lunchboxes, and lots of Coke ornaments from Coca-cola World in Vegas... To the best (okay, not right now!) team in the NHL!! 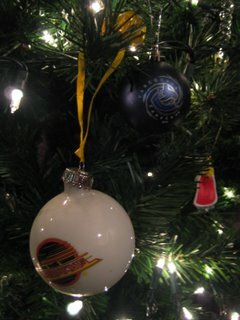 Very nice ornaments! I'm debating putting up our tree this weekend. I was thinking it could go up because we won't be here after Christmas - heading to Van to be with Andy's family from the 26th to ??? not sure on return arrival. There is the bigger Quesnel craft fair this weekend - Jack Frost and then Farmers Market - so I'm planning to head out and see if there is anything worth purchasing. I can't wait to see the outside of your house - I'm thinking of staying late on the 6th just to drive through Candy Cane lanes... is there a competition between the home owners? Are there people that don't participate?